Hi there! 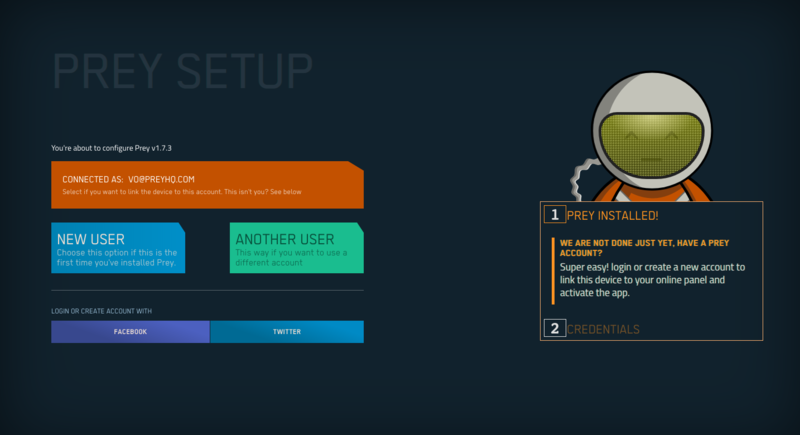 We've recently updated our configuration process for those users who install Prey on computers (Windows macOS, Linux). Now, after the installation is completed, you will be prompted to configure and link the device to your account through a website that automatically opens when the installer is done. This is a more intuitive process that allows the use of Social Logins, both for new accounts and to link them to an existing Prey access. Plus, you got a new friend there too! To prompt Prey to open the configuration website again, execute one of the following commands as an administrator, depending on your device's operating system.